A Non-Governmental Organisation (NGO) in Abuja is organising a free workshop and training for Nigerians. 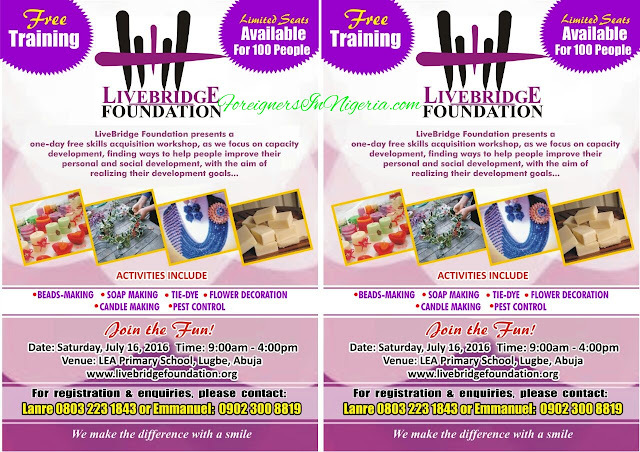 The event put together by Livebridge Foundation is presenting a one-day free skills acquisition workshop with focus on capacity development . This NGO aims at helping people to make their entrepreneurial dreams come true and to also develop them socially and personally. Please find the image below for comprehensive details.